Whilst the show and books are set to deviate quite dramatically, the core of Littlefinger's dastardly plan remains the same. In the released chapter, we are told that "The cake had required every lemon in the Vale". Why has Littlefinger bankrupted the Vale's supply of lemons? As every Game of Thrones fan knows, the only place in Westeros that lemons grow are in Dorne. In baking all the lemons in the Vale into a gigantic cake, Littlefinger forces the hands of the Lords of the Vale, compelling them to join in an invasion of Dorne if they hope to secure more lemons. In exactly the same way that Littlefinger gained financial control of the realm by bankrupting it, he has taken over the Vale in his citrus grasp. With this knowledge, we more clearly see Littlefinger's relationship with Sansa Stark. Many fans revealed their innermost depravity by assuming Littlefinger had lusty intentions towards young Sansa - but this can't be further from the truth! Littlefinger's love of lemons sees no bounds, and in the lemon cake obsessed Sansa, he sees a worthy ally. The books and show have Sansa and Littlefinger following different but similar plans. In the books, Sansa is to marry the oafish 'Harry the Heir', whilst in the show the plans are unknown, but it is rumoured that Sansa is to marry the evil Ramsay Bolton. 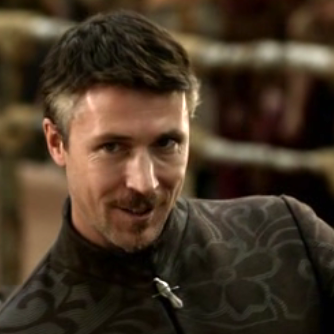 In both cases, the question arises - why would Littlefinger give away his most trusted ally. This is answered by an event I will call 'The Yellow Wedding'. Importantly, the 12 foot lemon cake that Littlefinger has baked has been weaponised. George RR Martin tells us that it is "a lemon cake in the shape of the Giant’s Lance, twelve feet tall and adorned with an Eyrie made of sugar". This gigantic citrus lance, topped with deadly sharp sugar, would prove a devastating weapon in any circumstance. Now Littlefinger's plan is clear: after securing Dorne's supply of lemons, Littlefinger is free to make a weaponised lemon cake even larger than this prototype. He will then be able to smuggle it into the wedding feast and use it to assault the guests. Actress Sophie Turner who plays Sansa Stark mentioned in interviews that she has a "controversial scene" coming up in season 5. This is the same language used to describe the unveiling of the 12 foot lemon cake, so it is certain these two events are linked. Come the Yellow Wedding, will show watchers thrill to the spectacle of Sansa blinding Ramsay Bolton with a squirt of lemon juice, before Littlefinger impales him with a 20 foot lemon cake lance? Will Lemonbowl beat out Cleganebowl as the most exciting bowl? Needless to say, season 5 will be the height of citrus-related drama! I think it's a joke?